Over the last ten years or so we have witnessed the emergence of Senegal's national team with great performances in the African Cup of Nations and recent World Cups. In a nation where less than 30% of the children can read and write, football in Senegal can play a big part in the development of young people's lives. This can be said for all footballers in Senegal from street players through to youths competing for professional status, aspiring to be the next Aliou Cissé. 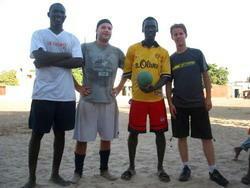 Our football projects in Senegal work with local teams. We work in conjunction with the local coaches to deliver our football development programme. The football coaching programme is based in and around the island town of St Louis, so training on a sandy beach for both skill and fitness is a regular occurrence which volunteers may find hard in the beginning but will soon adapt to. In the end some even prefer it to grass - after all this is the tropics. Volunteers coach football to a number of different age groups - under 12's, under 14's and under 17's. Local footballers tell you to look no further than the national motto, "One people, one goal, one faith". Everyone is invited! Sports volunteers should combine the Sports project with some time on a Teaching or Care project. Please let us know which option you prefer when you apply. 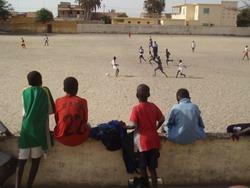 During your time as a football coach in Senegal you will be responsible for the development of young footballers' basic skills and techniques. You will co-ordinate and plan coaching sessions to develop skills such as ball control, accurate passing, keeping possession and moving into space. Furthermore you will help your supervisor, usually the team's part-time manager, to plan match strategies and you will take practice games. You will probably be asked to assist in team selection and to be 'on the bench' for weekend or evening matches. When you get to Senegal, you will be introduced to your team and the manager. Communication is one of the key aspects of sports coaching therefore it will be important to collaborate on how to structure the coaching programme. Don't worry if you have little or no coaching experience; we can provide a specific coaching manual for your sessions and the manager and his assistants will help you all the way, adding to your ideas. You'll be the foreigner and your very presence will help to make each training session fun - which is vital to maintaining the interest and enthusiasm of the children.